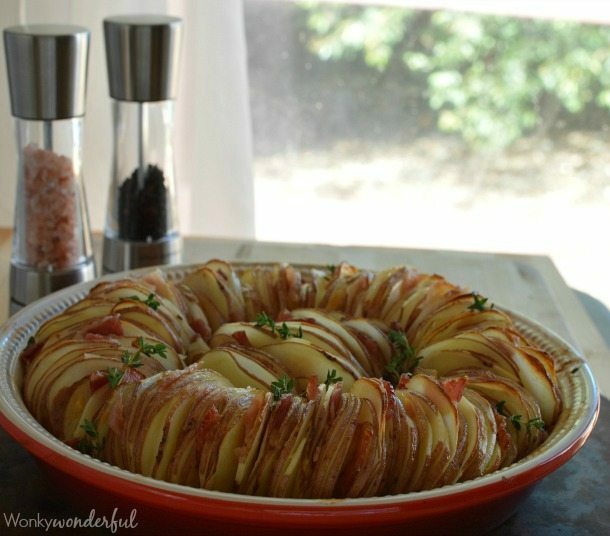 Just in time for the holiday season, I’m sharing this Roasted Potato Side Dish Recipe. 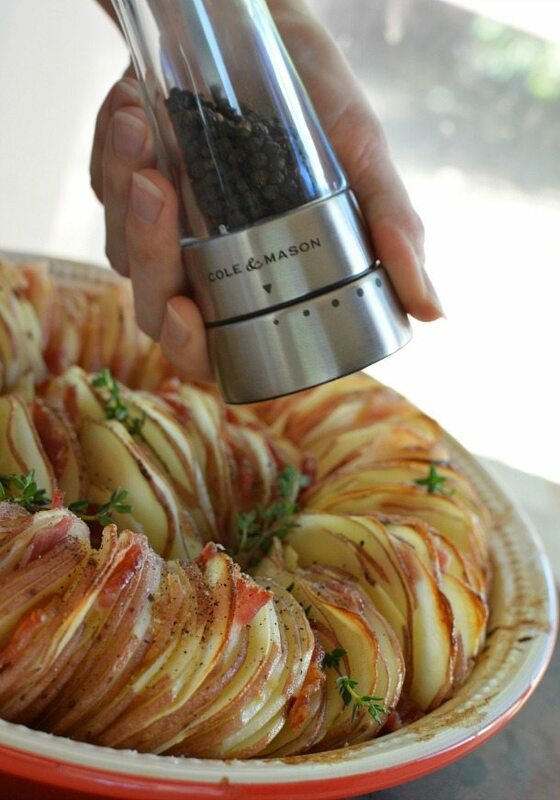 A gorgeous presentation of sliced red potatoes, roasted garlic, thyme, bacon, fresh cracked salt and pepper. This will be the star of your holiday feasts! This is one of those dishes that looks fancy but is really quite simple to make. No need to peel eleventy-million potatoes. I can’t be the only child that was forced to peel an entire sack of potatoes every Thanksgiving and Christmas. Sheesh, enough with the KP duty! Nobody needs that many mashed potatoes. 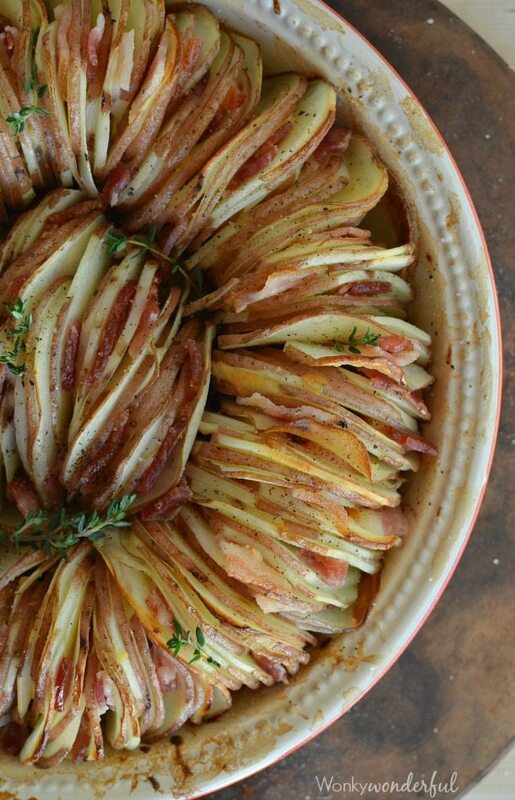 This potato side dish recipe does require a mandoline, unless you have some impressive knife skills. Everything else is simple and classic. Uncomplicated flavors and superior seasoning. 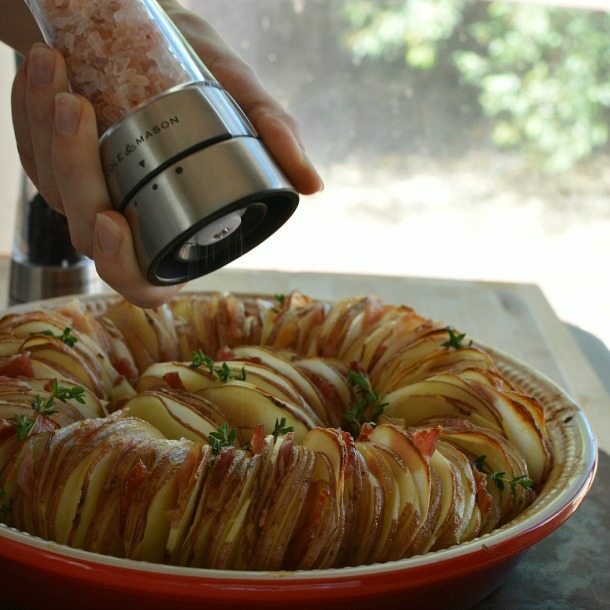 To get this dish perfectly seasoned, I used my Cole & Mason Derwent Salt and Pepper Mill set. These mills are a total game changer! One of those things that you don’t know you need until you have it. This Cole & Mason Derwent Set is a great gift idea for the person that has everything. Or, check out the other high quality Cole & Mason products for the perfect hostess gift. The Cole & Mason Derwent Salt Mill features a ceramic mechanism that ensures precise grinding. It has three grind adjustments. The smallest setting produces a salt powder. Powder! The best part is that you choose what type of salt to use. I love my Pink Himalayan Salt! Good quality salt really does make a huge difference in flavor. 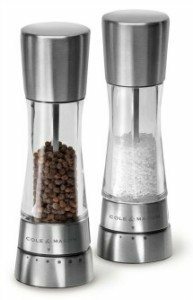 The Cole & Mason Derwent Pepper Mill features a hardened carbon steel professional mechanism with six grind adjustments. Both mills come with a lifetime mechanism guarantee. 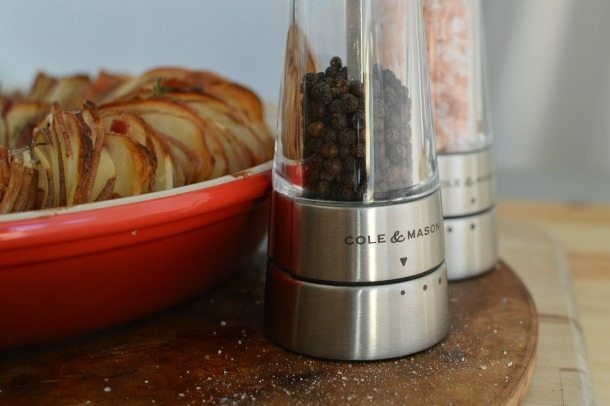 Surprise someone you love this holiday season with an elegant Salt and Pepper Mill Set. It is a gift that will be used for years to come. Or hey, get it for yourself. You deserve the best too, right? 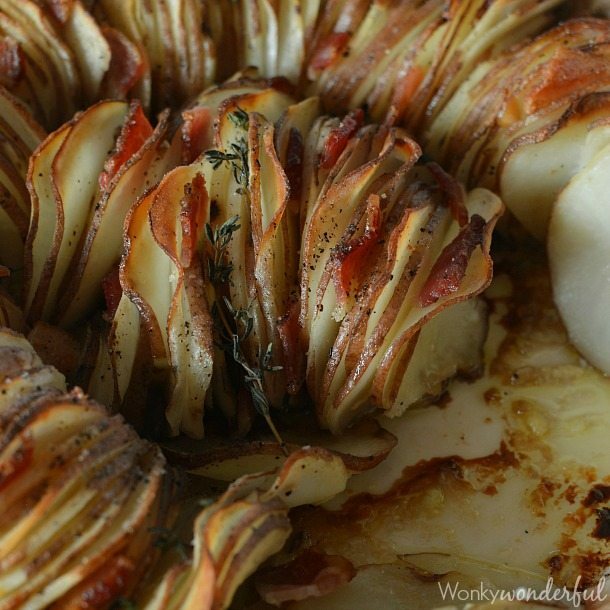 Then be sure to make this Roasted Potato Side Dish Recipe. 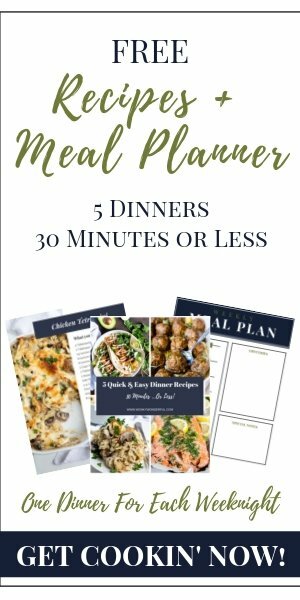 Your holiday meal just got a little fancier! Mix 5 Tb olive oil, lemon juice and roasted garlic paste in a large bowl. Thoroughly clean potatoes. Thinly slice potatoes with mandoline. (approximately 1/8 inch) Toss potatoes in olive oil mixture until evenly coated. 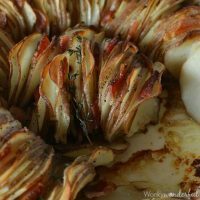 Arrange potato slices (accordion style) in a 10 inch pie plate. Bake for 1 hour. Remove from oven. Brush 1-2 Tb olive oil over the tops of potato slices. Tuck bacon pieces and thyme between potato slices. Generously salt and pepper with the Cole & Mason Mills. Return to oven and bake 30-35 minutes or until potatoes are cooked through. Potatoes should be soft in the middle and crisp on the outer edges. *I used some of the oil left over from roasted garlic. Made this the other night and it was a hit! I used Alderwood smoked salt on mine. The top parts of the potatoes turned out a little tough and more leathery than crisp. Has that happened to you? If so, how did you fix it? Glad you like it, Jace! I haven’t had the tough potato issue. Maybe slicing the potatoes a bit thinner would help with that. Have a great day! These look amazing! Is it possible to make them ahead of time? Thanks Janie! I have never tried making this ahead of time. Maybe if you par-bake it before then just finish it off the day you need it. But I can’t say for sure. This looks great. 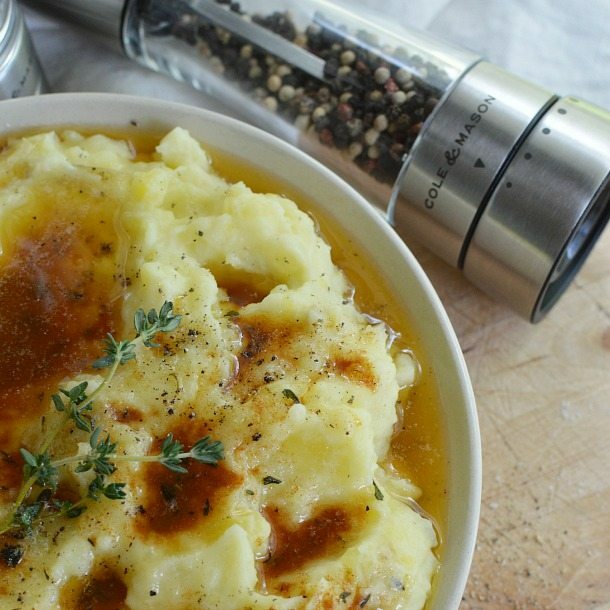 Do you par boil the potatoes before slicing ? Nope. Just thinly slice the potatoes raw. Enjoy!